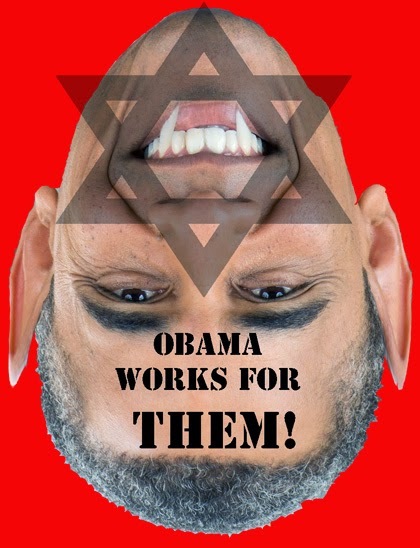 Jewish Racism: Obama Is a Traitor! Obama should have been waging war back on Putin. Instead, Obama has deliberately bought Putin time to invade and entrench in the Crimea and along the Ukrainian Russian border. Obama is a communist traitor. Had Obama led NATO to supply the Ukrainian Nationalists with food, weapons and military advisors; the Ukrainians would today be in a position to wage asymmetrical warfare on the invading Russians. The Ukrainians could withdraw most of their armor and aircraft into Poland and prepare with NATO for a major fight. But, no, instead Obama has telegraphed his economic punches to Moscow so his Russian jew buddies can empty their Western bank accounts ahead of any sanctions. Russia has stolen Ukrainian gas fields, so that the Ukraine cannot supply itself with energy. Russia has closed off Ukrainian Nationalists from the Crimea and flooded the region with soldiers and over the top propaganda. Obama is deliberately defeating the Ukrainian Nationalists, Europe and America, all for the sake of the communist invasion of Europe. We should impeach Obama. Will no one help me organize the POWER PARTY for a 2016 bid?